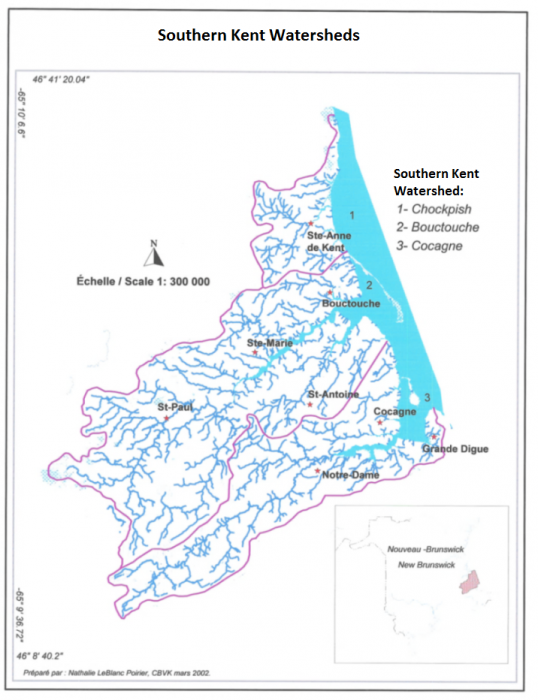 The Chockpish, Bouctouche and Cocagne watersheds are located in Kent County, in southeastern New Brunswick. All waters flows into the Northumberland Strait drainage, which is part of the Gulf of St-Laurence ecosystem. These watersheds are located in the coastal plain of the lowlands of the eastern New Brunswick, where the slope of the ground towards the sea is soft and not very marked. The Chockpish, Bouctouche and Cocagne rivers show slow water to moderate flow, short and not very deep, typical of the east coast of the province of New Brunswick. They have a diversity of habitats. The adjacent lands show wetlands; serene by low hills which gives the region character. The large amount of forested and agricultural land developments is typical to the majority of the watersheds land use. These land uses are what drives the regional economy and contributes to the water quality of the watershed. Numerous permanent and seasonal residences compose several little communities and two municipalities.